PDF cannot show up in preview window. I used free Citavi 6.1 version. Everything went well then suddenly, the pdf cannot show up in the preview, so I couldn't do anything inside the document. Meanwhile the website works. Regarding the pdf preview window, the pages can be changed while nothing shows up. I tried uninstalled and installed the app again, but that didn't help. The problem was related to Duet Display, thank you Wang for pointing it out. I was going to uninstall it, but before doing so I upgraded to the latest version that just came out (1.5.3.3), restarted my pc, and then PDF preview in Citavi magically started working again! Thank you very much for your message and your screenshots. We heard from about five other Citavi users about a similar issue with the preview. This might be related to a Windows update. Could you please send us a screenshot of your update history in Windows? Press the “Windows logo key" + "PrtScn". The screen will dim for a moment, and you will see the screenshot appear as a file in a folder entitled “Screenshots”, inside your default “Pictures” folder. Please also let us know the Windows version number (e.g. 1803) you will find under PC infos. Thank you very much for your timely reply. I attach my update history, please check it. There are five screenshots in total. My Windows version is 1803. Hope you can fix this soon. Citavi is really good and doing research with it is enjoyable!!! Unfortunately we cannot see anything unusual in the update history, so maybe it has to do with some graphics adapter update. The screenshot of your preview pane with a PDF loaded into it seems like it is loaded without any errors. That's what we already got from another customer's Citavi log file, which was completely error free. 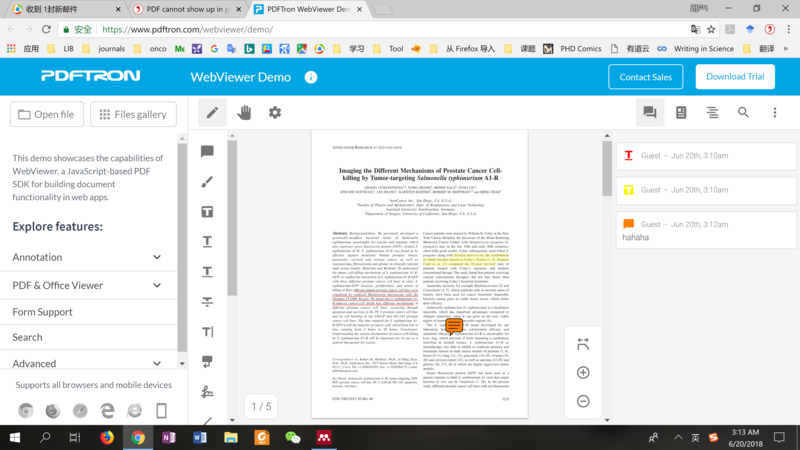 What happens if you enlarge the PDF view to full screen by clicking on the icon with the 4 arrows (pointing north-east, south-east, north-west and south-west)? Can you "pretend" to select some text on a page with your mouse, right click and choose copy (or CTRL + C). Will you eventually get some text into your clipboard that you can paste into a notepad for instance? Can you search the PDF for some simple words that should definitely come up with hits in you PDF? Will those hits be displayed and can you navigate to them? Sometimes it's white, sometimes it's black. Yes, I can copy the texts and images to my clipboard even though I cannot see them. I pressed the search bar, however I cannot figure out how to search. Could please run an additional test? Please open https://www.pdftron.com/webviewer/demo/. Click on "Open file" and choose a (non confidential) PDF-file from your PC. Would you please describe your results? I just ran the test, as the screenshot shows, it looks normal. I can underline, highlight, zoom, draw or make notes etc. As one of your screenshots shows, you are working with at least two monitors. The two monitors have different screen resolutions. May I ask you for another test? Does the problem occur if you set the same screen resolution on both monitors (or remove one of the monitors)? Sorry for my late reply. I set same resolution and remove the monitor, the problem still existed, as the attached screenshots show. The same problem happens to me! The root cause lays outside Citavi. We will try to find a solution together with the provider of the PDF control we have licensed for Citavi. On the Start menu, type "cmd.exe". Right-click the only search result (cmd.exe) and then click Run as administrator. SFC checks system files and may reinstall DX. After DISM has finished (this will take a while), repeat step 1. Check for missing Windows updates: Press the Windows Key + S and begin typing trouble and click on Troubleshoot. Near the top, under Get up and running, you will see Windows Update. Once you click there, you will see Run the troubleshooter. Windows will attempt to solve the problem by checking for pending updates. Follow the prompts and click on Apply this fix if that appears. Delete this software Duet display. I have the same probelm, but it can't be fixed with the solutions above. Are there other known causes for this Problem ? I am grateful for any hint. From the Start menu, open the Run dialog box. Click on the Display tab of the dialog that opens to find graphics card information. Save the information as text file. I have the same issue with citavi and I have also tried all steps without success. No matter what I do, the content of the pdfs is never shown. Any new solutions for the problem? We still couldn't figure out what cause this problem. Could you please provide more details for your configuration? Thank you. I would not make this a problem. Some web sites have so many scripts that they barely deal with this browser. There is nothing to put a problem on CITAVI.